The Huskies missed 11 of 12 from three-point range in the first half and fell behind by 17. 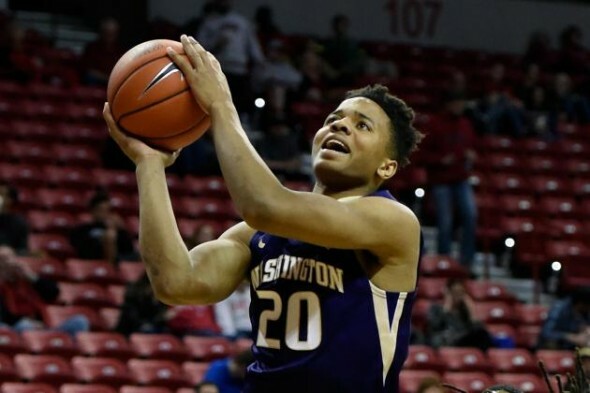 But a career-best 37 points from freshman Markelle Fultz provided UW’s second conference win. Despite a dismal first half and a slow start to the second, the Washington Huskies rallied to prevail 85-83 in overtime Wednesday night against the Colorado Buffaloes at Hec Edmundson Pavilion. A career-high 37 points from freshman guard Markelle Fultz was a big help as Washington overcame a 17-point, second-half deficit. Coach Lorenzo Romar praised his team’s resilience after going 10-of-31 from the field in the first half. Washington (9-9, 2-4 Pac-12) finally engaged with 10 minutes left. Trailing by 12, the Huskies went six-of-nine over the next five minutes, a 15-5 run that cut the Buffaloes’ lead to two points. Noah Dickerson hit a free throw with 21 seconds to play to put Washington up, 67-65, but a layup from Xavier Johnson tied the game 10 seconds later and forced overtime. Colorado (10-9, 0-6 Pac-12) fell quickly behind but rallied to exchange the lead with UW five times. A David Crisp three-pointer, his fourth, all in the second half, put Washington on top for good with :33 to play, thanks to free throw support down the stretch. Romar saw his team finally finish, something it has struggled to do in its conference losses. Not all specters of poor play have vanished. Washington fell behind early, missing 11 of 12 three-point attempts. Colorado’s size made it hard to find space in the paint. Washington managed nine points over the first seven minutes of play. Romar said it interfered with defensive focus. In the second half, Fultz scored 28 and had six of his eight assists. Dominic Green went three-for-six from beyond the arc to help, finishing with 11 points. Johnson led the Buffaloes with 20 points and 10 rebounds, while Derrick White scored 16 points and dished out six assists. The Huskies face a much tougher opponent in Utah Saturday (5 p.m., Pac-12 Networks). Romar hoped that Wednesday’s performance would boost confidence in turning around a slow start to conference play.